WASHINGTON, D.C. -- On his visit to Kiev, Ukraine, this week, U.S. Secretary of State John Kerry lauded Ukrainian protesters who "had asked for their rights and for democracy had instead been met with snipers' bullets." But Western leaders would be wrong to assume that all Ukrainians were clamoring for a "Western-style democracy" before protests erupted in late 2013. More than one in four Ukrainians surveyed last summer before the protests (28%) said a Western-style democratic republic was the most suitable political system for their country. However, a similar percentage (29%) felt a system that has a lot of similarity to the Soviet one -- but more democratic and market-based -- was the most ideal. A significant one in five Ukrainians (19%) waxed nostalgic -- saying the former Soviet system before "perestroika" would be best. Ukrainians' vision of the ideal government depends on their proximity to Europe and Russia. The majority of residents living in Western Ukraine -- and geographically closest to Europe -- believed a Western-style democracy is best for their country (57%), while less than one-third (30%) in Central Ukraine (which includes Kiev) felt this way. Fewer than one in six (15%) in the East -- which includes Crimea -- shared this belief. The Soviet-democratic blend and the old Soviet system appealed more to those in the East and Central areas than the West. 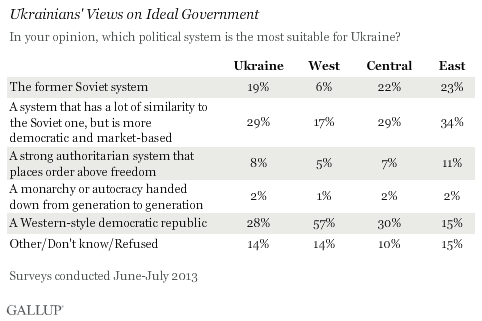 There is a sizable gap between what many Ukrainians see as the ideal government and their perceived reality. For example, Ukrainians overall were nearly twice as likely to see a Western-style democracy as suitable (28%) than to believe that it was the political system their country had at the time (15%). Ukrainians who were able to answer the question -- as many as 53% in the East did not know or refused to answer -- were most likely to believe that their existing political system was one with many similarities to the Soviet one, but more democratic and market-based. 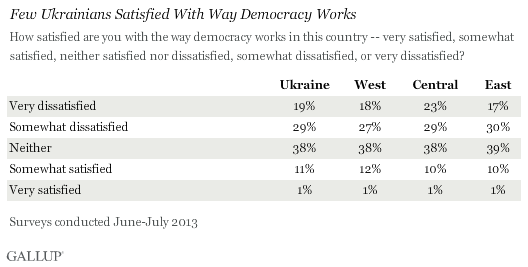 While Western-style democracy may not appeal to all Ukrainians, they do see a lot of value in democracy in general. 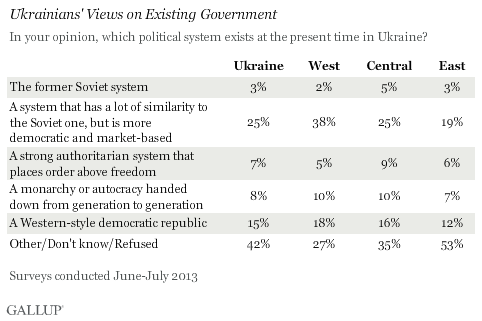 Nearly three in four Ukrainians (74%) said democracy is important for a country's development. However, few at the time of the survey were satisfied with the way it was working in their country. Barely more than one in 10 Ukrainians -- regardless of where they lived in Ukraine -- said they were "somewhat" or "very" satisfied with the way democracy works in their country. Ukrainians' dissatisfaction with the way democracy works in their country likely reflects the few gains that they believe "democracy" has netted them since the Orange Revolution in 2004-2005. Their economy was in shambles at the time of the survey and they saw corruption getting worse. However, the majority of Ukrainians (68%) also continued to believe it was important for the country to have an active political opposition, which was squelched under President Viktor Yanukovych's tenure. It will be extremely difficult for Ukraine to move forward until the ongoing crisis is resolved. But as it does find resolution, Ukraine will need to stabilize its economy and work toward political and economic reforms. The majority of Ukrainians at the time of the survey clearly believed democracy is vital for a country's development, and the majority saw a government with some element of democracy as most suitable. Lackluster support for any one type of political system suggests many Ukrainians would be happier with their own brand. Results are based on face-to-face interviews with 1,000 adults, aged 15 and older, conducted in June-July 2013 in Ukraine. Results based on the total sample of national adults, the margin of sampling error is ±3.7 percentage points at the 95% confidence level. The margin of error reflects the influence of data weighting. In addition to sampling error, question wording and practical difficulties in conducting surveys can introduce error or bias into the findings of public opinion polls. Americans' opinions of Russia and its president, Vladimir Putin, have never been more unfavorable, as Russia assumes a more muscular posture on the world stage. At least six in 10 Americans now view both Russia and Putin unfavorably. A majority of Russians (54%) in 2013 approved of the way Vladimir Putin was handling his job as president, but this rating is 29 percentage points lower than the 83% approval he received at the end of his previous presidency in 2008. As the 22nd anniversary of the Soviet Union's collapse approaches next week, residents in seven out of 11 former Soviet republics are more likely to say the breakup harmed their countries than benefited them.